Donald Trump’s war against a free press has extended into “the cyber,” where his followers at the Federal Communications Commission are intent on unwinding a vitally important free-speech protection that internet users won after years of organizing and effort. To make matters worse, the Trump FCC is carrying out its quest to kill Net Neutrality in a distinctly undemocratic way — including banning some activists from ever attending the agency’s public meetings for the alleged infraction of demonstrating their support for open-internet protections. And that’s just one in a growing number of incidents in which the FCC has cracked down on the rights of people who support Net Neutrality. During the monthly FCC meetings that have occurred since Trump FCC Chairman Ajit Pai took office, agency staff and security have denied the First Amendment freedoms of people and reporters attending the events, which are supposed to be open to the public. Pai’s agency has also violated protesters’ due-process rights. In response to this escalated attack on the First Amendment, Free Press and Free Press Action Fund on Monday submitted a letter to the FCC’s general counsel demanding that the agency address these incidents, and explain its rationale for shutting up and shutting out Net Neutrality supporters who have come to its monthly public meetings. The letter details a series of incidents in which the federal agency and members of its security staff have silenced dissenting voices, manhandled a reporter and barred members of the public from its meetings. Though Pai gamely sang along while being “rickrolled,” his security staff wasn’t as forgiving. As they escorted the activists from the room, they stopped other individuals present from recording what was happening. 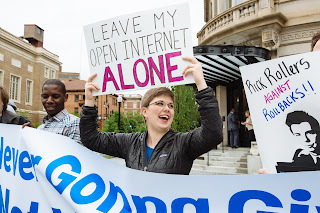 FCC security informed the protesters on the spot that they would be “banned for life” from the agency and could be banned from other federal buildings as well. Any such ban — without warning — violates the due-process rights of these activists, according to the Free Press/Free Press Action Fund letter. On May 18, after the FCC’s May open meeting and press conference ended, agency security staff pinned CQ Roll Call reporter John M. Donnelly to the wall after he attempted to ask Commissioner Michael O’Rielly a question in a public area outside the open-meeting room. The agency’s bizarre behavior goes beyond what’s outlined in the letter from Free Press and Free Press Action Fund. During Pai’s first open meeting as chairman, Net Neutrality supporters attempting to deliver letters in support of the open internet met with a beefed-up security response, including demands to take all protest signs away from the building. These incidents and others are part of a growing series of FCC efforts to stifle free speech and public participation at open meetings — and part of a disturbing national trend of mistreating protesters, reporters and members of the public during the Trump presidency. In Washington, D.C., at the Superior Court of the District of Columbia, more than 200 anti-Trump protesters are facing felony riot charges that could result in prison terms of 70 to 80 years. Their “crime?” Participating in mass Inauguration Day protests near a location where a smaller group of “Black Bloc” anarchists smashed windows and clashed with police. Among those arrested in the D.C. police sweep were a number of journalists. Chairman Ajit Pai appears to disdain people’s free-speech protections nearly as much as the man he admires in the White House. When senators asked Pai whether he shares Donald Trump’s objectionable view that news organizations and journalists are “the enemy of the American people,” Pai ducked and dodged, refusing to give a direct answer to the question beyond offering a non-answer about the literal existence of the First Amendment. But Pai’s actions against free-speech rights online and at the FCC speak louder than his often evasive words. Holding the Trump FCC to account is just part of the work needed to push back against this administration’s ongoing attack on free speech, dissenting views and press freedom. Protecting First Amendment rights is as vital to the resistance efforts as stopping the FCC’s plan to kill Net Neutrality. It’s a fight everyone must take part in before it’s too late. If you’re facing any problem related AOL Email, so just contact AOL Customer Care Number 1800-863-5563 and get solution within few minutes.